Does my child need to be signed in and out by a parent or guardian? Every child must be accompanied by an adult for registration at the start of each day and collected by an adult at the end of each day. No child will be permitted to leave without being signed out by an appropriate parent or guardian. Unfortunately at the LFC Academy venue parents are not permitted to remain onsite once registration has taken place. What time do the Soccer Schools start and finish? All times can be found on your confirmation email. Please contact us if you require another copy. Are there any cafeteria facilities available at the LFC Academy? The LFC Academy does not offer any cafeteria facilities for visitors. Where are the Soccer Schools held? 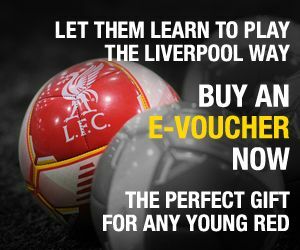 Unless specified on your confirmation email, all LFC Soccer Schools take place at the LFC Academy venue in Kirkby, Merseyside. The address for the LFC Academy is The Liverpool Way (off Arbour Lane), Kirkby, Liverpool, L33 7ED. Kirkby is situated in the north of Liverpool, and from the City Centre to the LFC Academy via public transport it takes approximately one hour at peak travel times. There is a direct bus route to Kirkby from Paradise Street Bus Station and also a train service from Liverpool Central. For more information on transport links and timetables please visit http://www.merseytravel.gov.uk/Pages/Welcome.aspx. What type of footwear will be need? We recommend that your child has suitable footwear for playing on all-weather surfaces. Any boots or trainers with rubber soles or plastic studs are most suitable. We will not allow any metal studs or metal blades at any of our courses. Are parents allowed to take photographs? No photography of any kind is permitted at any of our soccer schools unless by the designated club photographer. Please see our terms and conditions for further details. Our Head Coach will hold all emergency contact information for every child and will contact you directly in the event of an emergency. Please ensure you provide the correct contact numbers at the time of booking. What is included in the price I pay for the Soccer School? Your child will receive expert coaching delivered by qualified Academy coaching staff and a certificate of attendance signed by Ian Rush. Any additional gifts or prizes will be confirmed in each individual course description which can be found on your confirmation email. All are UEFA/FA qualified coaches and possess valid Emergency Aid and Safeguarding Children Certificates. All coaches have been DBS checked. Will any members of the first team be present at the Soccer Schools? The first team train at a separate venue and must be committed to their training programme. This means that it will be unlikely that a player will be in attendance at one of our courses. What does my child need to bring to the Soccer School? Do you run any residential camps? What type of residential courses do you offer? There are two course options – a football only programme and a football plus education option. Specific dates and details can be found here. What is the age range for your residential camps? These courses are for boys and girls ages 12-17 years. What about information relating to courses held at other venues? 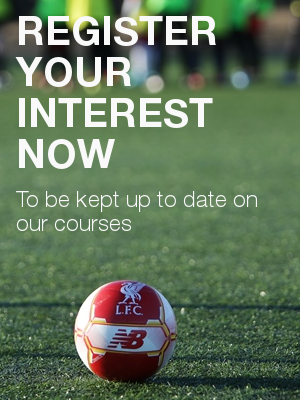 Information relating to other International Academy courses can be found on our website at https://soccerschools.liverpoolfc.com/international-courses. All information relating to your chosen course can be found on your confirmation email. Please contact us if you require another copy.